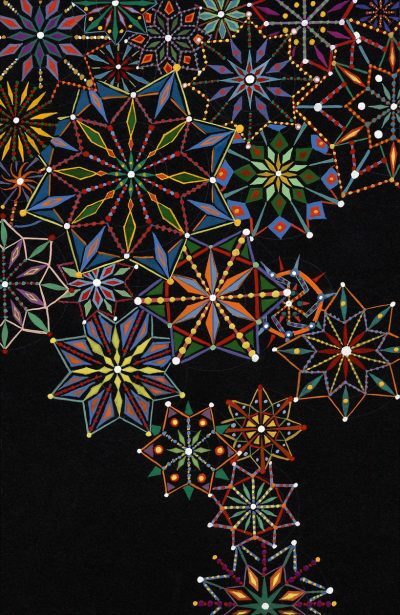 American artist Fred Tomaselli (born 1956) studied painting at California State University, Fullerton, before moving to New York in 1985. Tomaselli’s collaged paintings are remarkable compendia of natural and unnatural worlds. Combining unorthodox materials, such as prescription pills, herbal remedies and psychoactive plants, they draw parallels between the mind-altering properties of these substances and the traditional understanding of painting as a window to another reality. Tomaselli has exhibited extensively in Europe and the US, including a solo exhibition at IMMA in 2005. His works are held in major public collections worldwide.